Prostate cancer is one of the most common types of cancer in men. The American Cancer Society estimates slightly over 240,000 new cases of prostate cancer are diagnosed in the United States each year. 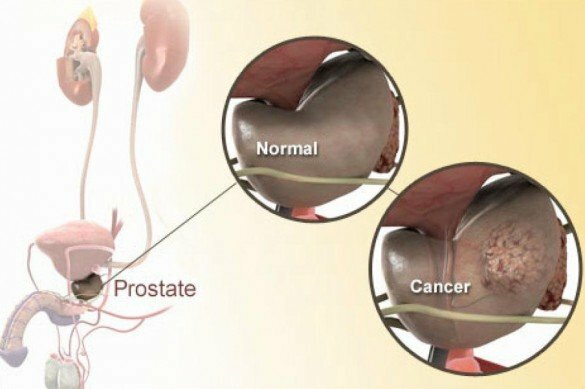 Prostate cancer begins when a cells start to divided uncontrollably within the prostate gland (a small, walnut-sized gland located just below the bladder and wrapped around the urethra). Eventually these cells form a visible mass or “primary” tumor. This primary tumor is thought to play an essential role in the development and growth of other tumors that may develop in the prostate. Generally a high PSA or a change in PSA is a first warning sign that prostate cancer may be present. However, a high PSA does not mean prostate cancer. A Digital Rectal Examination may also be used to test for prostate cancer. If cancer is suspected a urologists will schedule a prostate biopsy to try and confirm diagnosis. 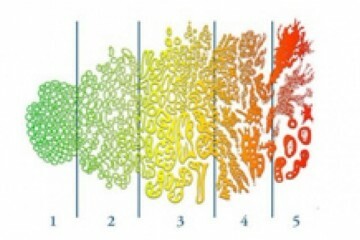 Tissue from the prostate is viewed underneath a microscope and the results are reported using a grading system called a Gleason score to measure how aggressive the prostate cancer might be on a scale from 1-5 (see image at left). At the Sperling Prostate Center we believe that it’s important to have an MRI prostate scan before a prostate biopsy is performed by the urologist. The image and resolution produced by MRI is highly detailed and can detect tiny structural changes within the prostate. Often, Dr. Sperling will use various contrast agents to increase the accuracy of the images and to help identify potential tumors. The MRI scan can be an extremely accurate method to help the urologist detect prostate cancer. Additionally, it can provide important diagnostic information about the size, location and shape of any tumors – all critical information for guiding a biopsy or treatment. In addition to MRI scanning, Dr. Sperling can perform an MRI-Guided Biopsy of any tumors identified during the scan. This highly precise procedure can help to improve the accuracy of cancer detection while also reducing the number of needle samples required. The best treatment for your prostate disease may not always be clear. If the tumor is very low risk there maybe several options including watchful waiting or a targeted treatment, like MRI-Guided laser ablation, of the primary tumor. If the tumor has a little higher risk but is still at an early stage, there maybe several options, including surgery, radiation therapy, or whole gland thermal ablation (destruction) using minimal-to-non invasive technology. If the prostate cancer has spread there are drugs to reduce testosterone levels or chemotherapy. Surgery, radiation therapy, and hormonal therapy can interfere with sexual desire and performance. Problems with urine control are common after surgery and radiation therapy. These problems may either improve over time or get worse, depending on the treatment. Discuss your concerns with your health care provider and consider all the options based on an accurate understanding of the extent, location and grade of your prostate cancer.